Location is all the rage right now. The iPad is all the rage right now. So it makes sense that when you combine the two, you’re going to get something awesome. But there’s just one little problem. The iPad, with its 9.7 inch screen is way too big to fit in your pocket. To take it with you, you’ll have to carry it in a bag of some sort. And you’re probably not going to whip it out in the middle of the street and start using it. 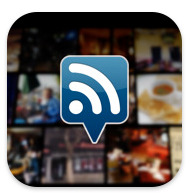 So Loopt has built a new location app specifically tailored to the different iPad experience. Or, at least what they think the iPad experience will be. Founder Sam Altman believes that people are most likely going to use the iPad sitting around their homes or hanging out at local coffee houses, like Starbucks. If that’s the case, it means that the iPad may be better suited for planning events around location, rather than actively participating in location. 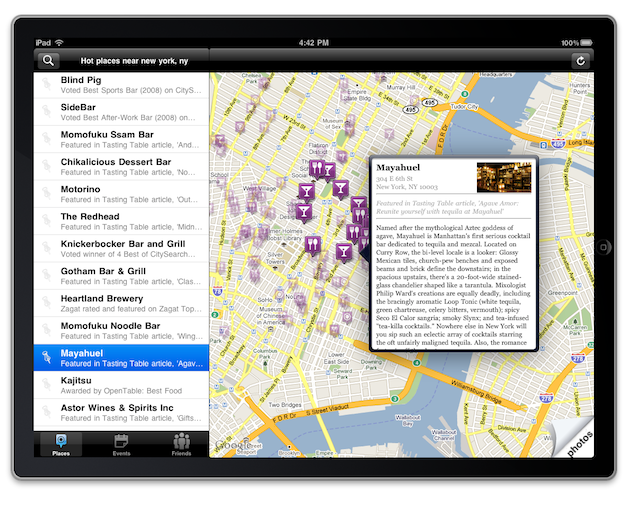 With Loopt Pulse, you load up the main screen to see where you are and everything that’s going on around you. On the left side of the screen you get a list of places, and on the right, you can see each of those places on a map and more details about them. These featured places appear because a lot of Loopt users liked the place, or are currently there. Or maybe the place has positive reviews in the local paper. You can also sort by events and friends. On the friends tab, you only see places that your Facebook friends like (you connect via Facebook Connect). “To most users we’ve spoken to, that’s the recommendation they care about the most,” Altman says. 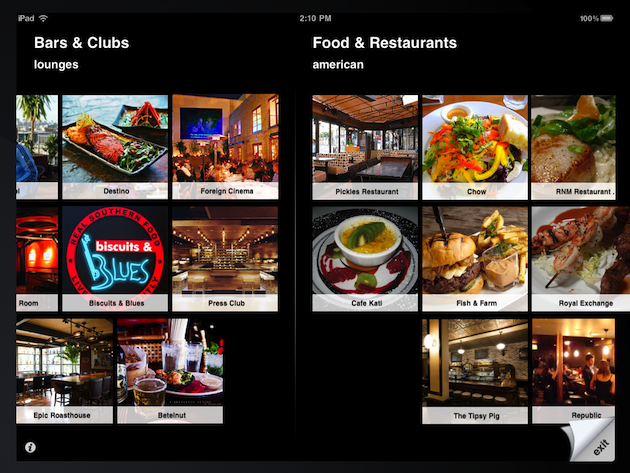 But Loopt also wanted to take advantage of the iPad’s big, beautiful screen, so they also built a new feature that allows you to browse local places by pictures. As you can see in the second screenshot below, you can flip through pictures of different places like a book. Loopt Pulse is already live in the App Store alongside all the other initial iPad apps. And actually, Apple is already promoting the app on the main page of the App Store. This type of promotion is crucial when it comes to making or breaking an app. Loopt knows this well as it got off to a quick start in 2008 when it launched on stage at Apple’s App Store unveiling event. You can find Loopt Pulse here, it’s a free download.